She is 12 ft. long and 8 ft. high, and is guaranteed to delight audiences of all ages! 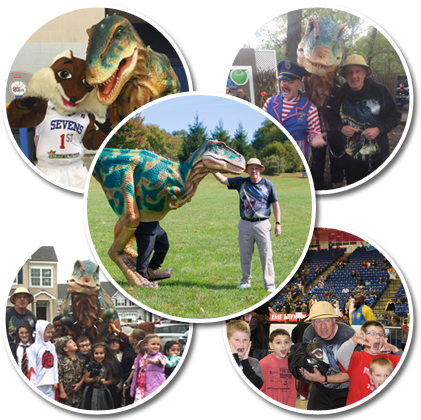 Dolly the T-REX is available for all occasions and events: libraries, schools, day cares, nursing and retirement homes, birthday parties, private parties, corporate events, TV & movie appearances – you name it! Jungle John’s Jurassic Journey! An educational and fun show, highlighting dinosaur facts, sharing dinosaur artifacts, and doing live demonstrations with Dolly the T-Rex and her dinosaur friends. Call us today for more information, pricing and availability – she’s the only T-Rex in town and is booking up fast!